A little research into the subject turned up some fascinating information. 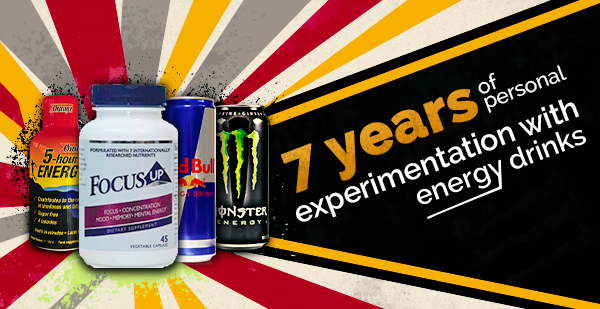 For example, the term “healthy energy drinks” is searched 2900 times per month on Google, compared to “cocaine energy drink”, 4400 searches, and “cannabis energy drink,” 4400, giving us the obvious impression that the vast majority of people are much more interested in getting wired than healthy. All that being said, I have had an interest in healthy energy drinks, and it’s twin, mental clarity, for about 7 years. To qualify as healthy, we have to eliminate products that have an excess of either sugar or caffeine, or are otherwise obviously formulated to give a ton of energy, regardless of the health effects. I mean, if you are going to down 300 MG of caffeine and 50 grams of sugar in one can, why not just have an MMA fighter give you a good hard shot to your liver? It’s probably about sixes as to which is more harmful. So, after eliminating all the high sugar, high caffeine drinks, let me tell you what I have found personally, and the three energy drinks that I now use, and why. But first of all, it’s important to understand caffeine. There is, in my opinion, a lot of noise about caffeine, and people have formed various opinions of it without really reading through the plethora of great research available on the subject. –The US Food and Drug Administration considers more than 600 MG of caffeine a day to be unhealthy. -The Mayoclinic, a very trusted source, claims 400 is the max. -Caffeine use is a personal thing. Some people are very sensitive, and even a little bit will give them the jitters. If that’s you, you can probably stop reading now because even the healthiest of healthy energy drinks contain some caffeine. -Too much caffeine can cause insomnia, nervousness, restlessness, irritability, stomach upset, fast hearthbeat, and muscle tremors. (Too much per day is either 400 mg per day, or 600, depending on who you listen to). My personal threshold is 300. –400 mg of caffeine is roughly 4 cups of brewed coffee, 10 cans of cola, or two energy drinks. -Caffeine can be hiding in over the counter pain relievers, often as much as 130 mg per serving, so if you take pain relievers daily, make sure and find out how much caffeine is in them. –Caffeine Anhydrous? Some formulators try to claim their product is superior because it contains caffeine anhydrous, a more natural form of caffeine. This is probably bogus. “Anhydrous” simply means “without water,” it is simply dehydrated caffeine. According to Livestrong.com, caffeine is generally considered safe, and has been proven to improve performance in extended activity such as running or cycling, time trial performances, or sports like soccer or rugby. Preliminary research shows that even Golfers can benefit, and that contrary to popular opinion, they not only golf better by a couple of strokes, but they are more accurate, and have a little bit more strength. And for a competitive golfer, 2 strokes over 36 holes can mean the difference between making bank, or being sent home! Again, this is a personal thing. Although I take a mental clarity/ energy drink every day when I’m working, when I went to Europe for 3 months I didn’t take any energy drinks or powders and didn’t notice any withdrawal effects or cravings at all. This may not be the case for everybody, of course, the term “know thyself” applies. One thing I have learned about caffeine is that it should be used to aid your natural cycles, not work against them. For example, a good, healthy energy drink is often also a mental stimulant. I am usually at my best in the morning, and get my most important work done then. So, a great mental clarity, healthy energy drink aids my natural cycle and gives me a mental and energetic boost, right when I need it most. If I ever feel like I need an energy drink in the afternoon, my rule is never after 4 PM, as that would interfere with sleep. 1. As a mental and physical stimulant. 1. Healthy energy drinks as a mental and physical stimulant. Q: How many of you are 100% effective for 8 hours of a working day? Not a SINGLE hand went up! Q: How many of you are 100% effective for 6 hours a day? A handful of hands went up. Q: How many of you are 100% effective for 4 hours a day? More hands. He then narrowed it down to 3, 2, and one hours. The bulk of the room agreed that they were highly effective and at their best for between 2-3 hours per day. He then advised that those 2-3 hours of limited, highly effective work time are common for most people, even the very most effective people. And, he challenged us to find out when those 2-3 hours occurred in our own Circadian rhythms. For some people, Winston Churchill for example, midnight to 2 AM is the best possible time for them to get their most important work done. For others its early or late afternoon or evening. But for probably 80% of the population, their very best, most creative, effective hours happen between 6 AM and 11 AM. -Make sure that you turn off your phone, find a quiet place, and generally shield yourself from electronic devices and other distractions, even people if possible. -Plan your day so that the very most important one to three projects are scheduled during that time. Do not check e-mail, or respond to texts, or get sucked into social media during this time. -Take a healthy mental and physical stimulant to really get those brain waves humming, and ensure that you have a high degree of clarity and focus. I have found this process makes me more effective. And the drink I have found that best helps is Focus Up by Xooma Worldwide. 2. For athletic competition. For long endurance events, I have found that a couple of Hammer Gel’s, with about 50 mg of caffeine really helps me get started, then later in the race, when I’m starting to lag, there’s nothing like a Focus Up to help me feel better and perk up. I know a lot of other athletes like 5 Hour Energy for this as well, it’s worth experimenting with. The first time I used an energy drink in a race was in the Boise Half Ironman. I decided that after the 1.2 mile swim and 56 mile bike ride, I would drink a Focus Up right before the run, when I really needed a pickup. I had a drink mixed up and ready to go in the transition area, and I guzzled it down as I ran out. Not only did it pick me up and help me feel better and more energetic, but the mental pick up was noticeable. I had been dragging the last few miles of the bike, and a drink of Focus Up just picked me right up. I ended up running the half marathon in 1:44, a personal best, and not bad for a 47 year old, I was very happy with that time. And… I passed a LOT of people who had started earlier, who were obviously struggling. Nothing like a good physical and mental shot when you need one. 3. To stay awake while driving. For this, there’s just nothing like a 5 Hour Energy or a Red Bull. Red bull: They have a good kick to them, they are readily available at any gas station, and they are much more healthy (in my opinion) than a Rockstar or Monster. Now, I’m not saying 5 hour energy, Red Bull, or Monster are “healthy energy drinks.” The reason they are listed here is because one of the most unhealthy things that can happen in your life is to fall asleep while driving, cross lanes into on-coming traffic, and turn your car into a mashup of metal and leather in the front grill of a semi truck. A 5 hour energy or Red bull is readily available at any gas station and could save your life if you are getting drowsy. Or, better yet, just don’t drive. But to just take the edge off of drowsiness, I have many times picked up a red bull at a gas station and had the mental zip I needed to drive a few hours perfectly safely. 5 Hour Energy. For athletic competition or if I’m getting drowsy when driving. Red Bull. Pretty much my last choice if nothing else is available. Obviously, feel free to argue with me about just how “healthy” these are. But compared to others, they contain good healthy ingredients, not too much sugar, and a reasonable amount of caffeine. Plus, when used wisely, and sparingly, can help you get more work done, stay awake while driving, and even race faster and better.